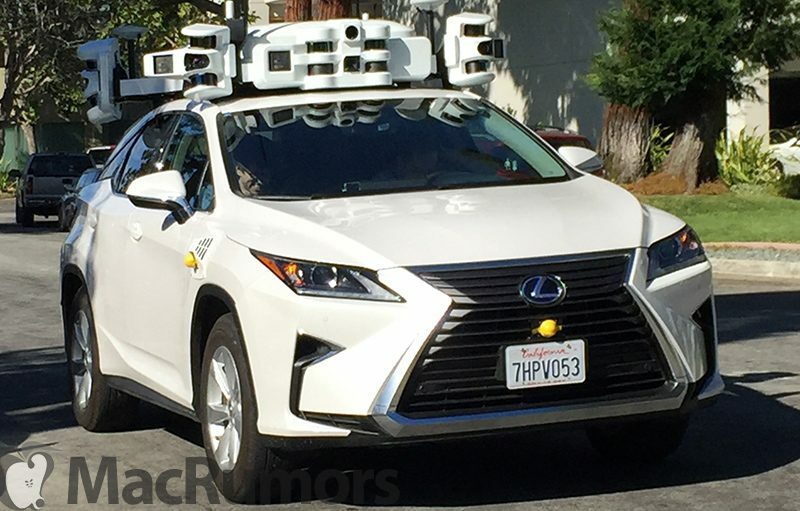 Apple has been testing Lexus SUVs equipped with its autonomous driving software out on the roads around Cupertino since April 2017, and for the first time, the company has filed a disengagement report with the DMV. A disengagement report tracks the number of times an autonomous vehicle disengages and gives control back to a safety driver or the number of times the safety driver in the vehicle interferes. All of Apple's self-driving SUVs have safety drivers able to take over in the event of an emergency. The DMV will be publishing the full reports later this week, but they appeared briefly on the website and The Last Driver License Holder was able to get a brief look at some of the data. The information covers the period from December 2017 to November 2018 for all companies operating self-driving vehicles in California, including Apple. According to the data, Apple registered 871.65 disengagements per 1000 miles, with a disengagement approximately every 1.1 mile. 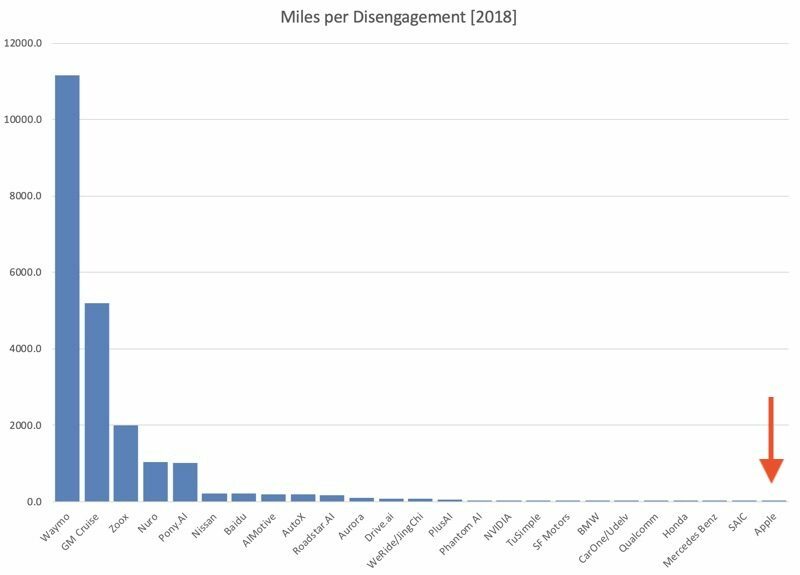 For comparison's sake, Waymo, Google's autonomous vehicle arm, had 0.09 disengagements per 1000 miles with 11,154.3 miles per disengagement. Apple's total number of disengagements was higher than any other company doing autonomous vehicle testing, suggesting Apple drivers need to take over for the self-driving vehicle more frequently than other companies as it works out kinks in the software. This could be because Apple is driving more challenging routes, Apple drivers are abundantly cautious, or it could be because its self-driving software is less evolved. There are likely multiple factors at play when it comes to Apple's performance, and it's worth noting that Apple has not been testing self-driving vehicles for as long as other companies. Disengagements are self-reported numbers and companies are able to take some liberties with how this data is reported and just what counts as a disengagement, so the data should be viewed with that in mind. According to the data, Apple has 62 self-driving vehicles out on the road, though earlier reports have suggested that number is a little low. As of November, Apple reportedly had 72 vehicles on the road. Apple's self-driving vehicles were involved in two minor collisions in 2018, one in August and one in October, though neither collision was Apple's fault. In the August collision, the vehicle was in self-driving mode, while in the October collision, it was in manual mode. More detail on Apple's self-driving car performance will be available later this week when the full reports are released. Apple has been disengaged since Jobs passed. If the ANN powering Apple's self-driving car is anything like Siri's, I can't exactly say I'm surprised. Those two could make a lethal combination. A disengagement every mile? That’s not a self-driving car, that’s just a car. Just wait until Apple Car Series 2. 50% fewer disengagements and 50% safer! wonder why tesla is not on the list? This failure and that of Siri underscores how weak Apple is in machine learning. While Google and FB garnered some of the best talent, Apple went to the charlatans. Expertise in ML is key to a tech company's future and Apple has lost that future. I am a private pilot on the side and hold a few ratings VFR, IRF, complex, multi-engine, and I can tell you from experience, creating an fully autonomous commercial grade auto pilot (which have existed for decades) to takeoff, fly a complex cross country pattern, make final, flair, land, rollout and stop at the end of a runway is far less complicated than creating a self driving car. Every day I'm more tempted to disengage from Apple.